The autumn 2012 anime season kicked off with all kinds of interesting-looking shows. Magi, BTOOOM!, Shin Sekai Yori, Ixion Saga DT, and many others flooded the Japanese airwaves and the Internet, all vying for attention. As a man, I knew the culturally acceptable choice would have been shows like Magi, BTOOOM!, Gintama, or Sword Art Online. 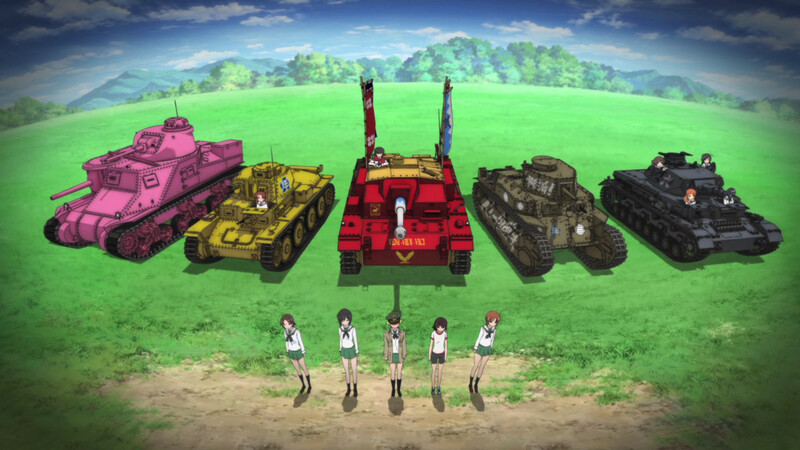 Yet, out of all the manly shows I could have watched, one kept calling to me: Girls und Panzer, the bizarre-looking clash of teenage schoolgirls and tank battles. I had a feeling this show could easily have been a thin excuse for fanservice (like the anime world even needs one nowadays) with just a smattering of testosterone-pumping tank action. But the weird concept looked too good to pass up. And so, against ingrained societal pressures, I began watching. What I saw surprised me—in a good way. Girls und Panzer wasn’t that weird. 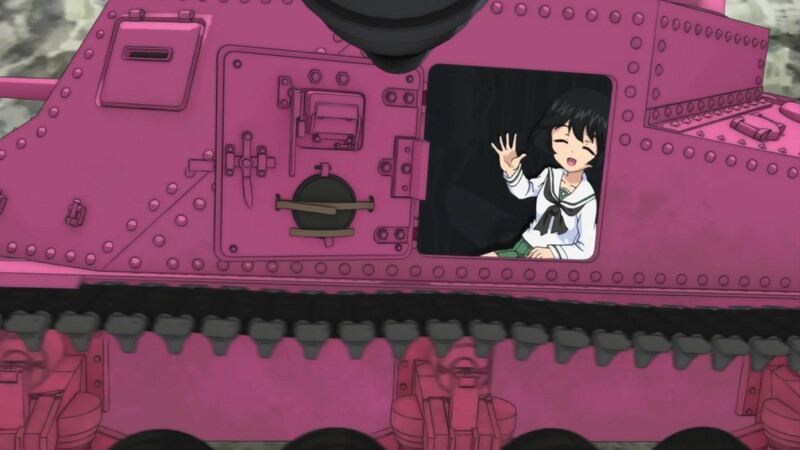 The idea of teenage schoolgirls operating tanks was one I got used to surprisingly quickly. And while there was fanservice, occurrences were mercifully sporadic and never lasted long. But this only covers what Girls und Panzer is not. What, then, is Girls und Panzer? What makes it a sleeper hit? Four elements one may not expect from a superficially bizarre show: quality animation, outstanding music, solid characters, and a brisk plot. 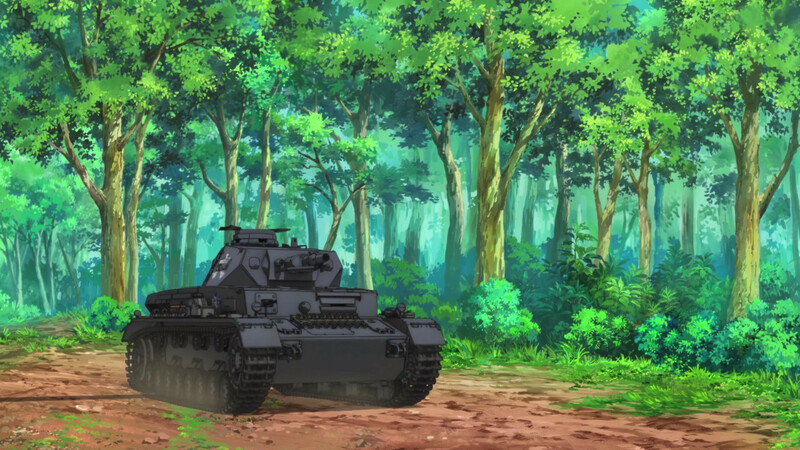 Girls und Panzer is gorgeous—and I’m not talking about the girls. The characters are well designed (okay, I am talking about the girls, but they’re not the point…), and the environments shine with lush and vibrant colors. But one of the best-looking parts of the show is the 3D tanks. Normally, I find 3D in 2D animation obnoxious and intrusive. 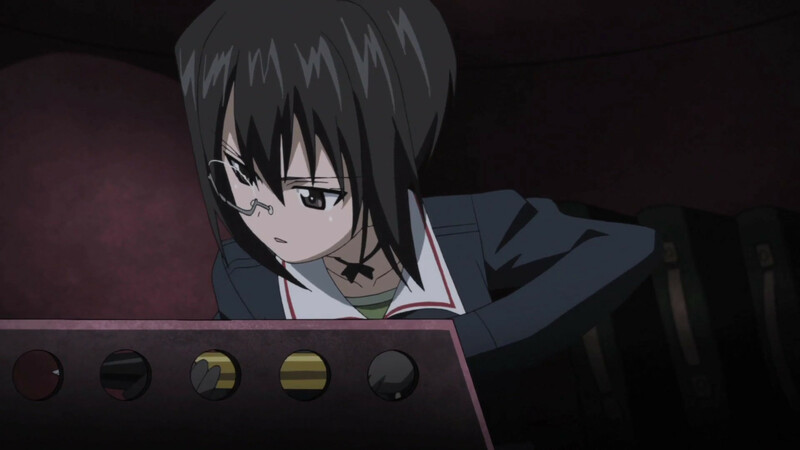 Girls und Panzer’s animators, however, somehow make it work. 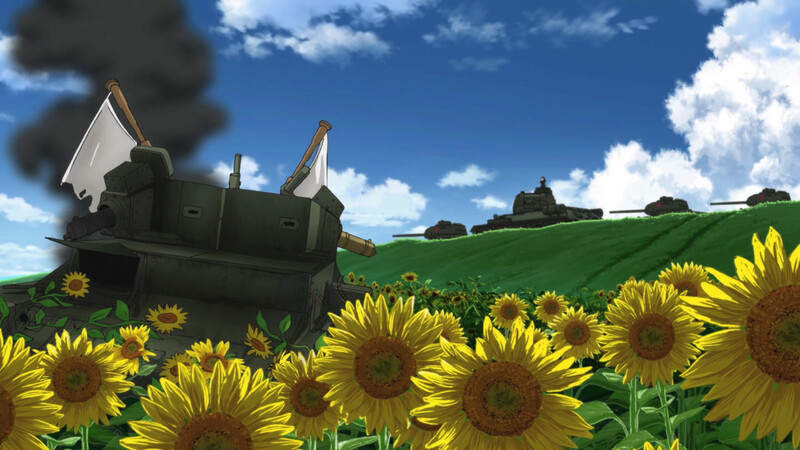 In the first few episodes, the tanks looked obviously 3D, but they didn’t stand out too badly. With each episode, however, the tanks looked and moved less and less like 3D objects—until I completely forgot they were 3D. 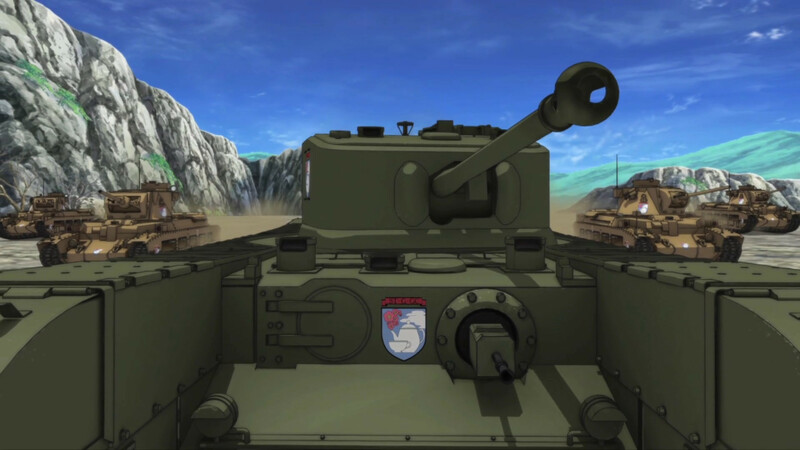 This may well be Girls und Panzer’s greatest technical achievement: successfully blending rendered objects into a drawn world. Granted, there are probably dozens of other shows that have already done this. 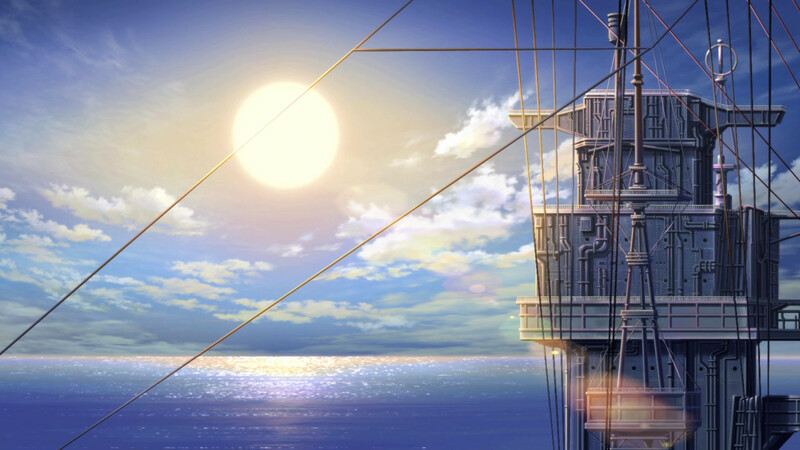 Nevertheless, the high quality of the animation, both 2D and 3D, reflects well on the show and on the diligence of the animators. 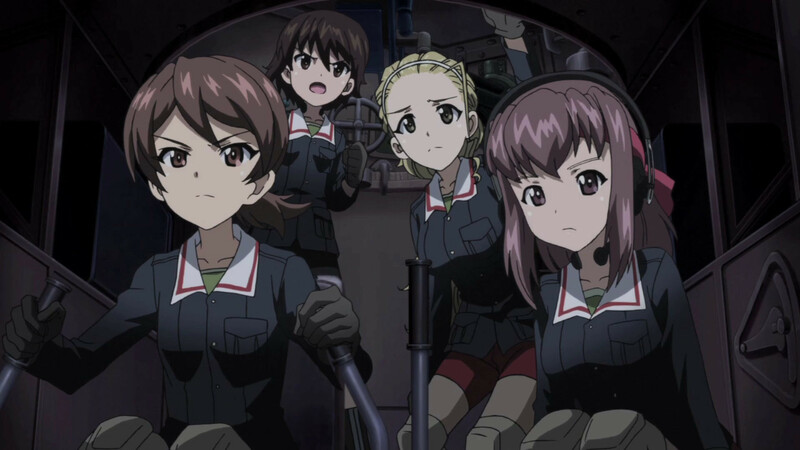 Girls und Panzer doesn’t just look good—it sounds good, too. Specifically, the soundtrack skillfully captures the essence of the show. This essence is a multifaceted quality, encompassing the lovableness of the protagonists, the goofiness of their lives, the determination with which they strive, the pride of their rivals, and the intensity of their tank battles. The battle music is surprisingly and wonderfully suspenseful for an otherwise lighthearted high-school sports underdog drama. It grabbed me and left me breathless as the girls faced one trial after another. It endeared the girls to me as much as the more lighthearted music did. 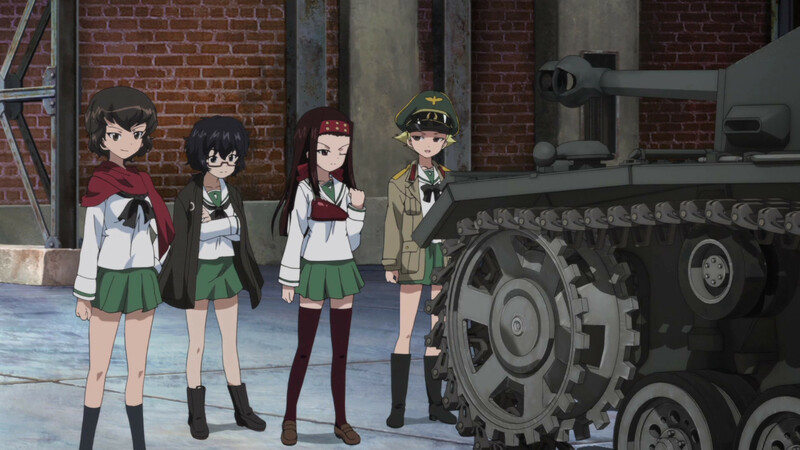 The girls themselves are Girls und Panzer’s strongest element. Not content with being just shallow schoolgirl stereotypes, many of them experience considerable growth despite the show’s silly premise. Although fought as a combat sport in-universe, the tank battles gradually forge the girls into young women, teaching them maturity, dependability, responsibility, and valor. Although each girl already has a unique, flavorful personality, it is in battle that these personalities are truly defined. What started as merely charming characters have become genuinely endearing to me. But what good are beautiful animation, stirring music, and endearing characters if they are utilized haphazardly or clumsily? 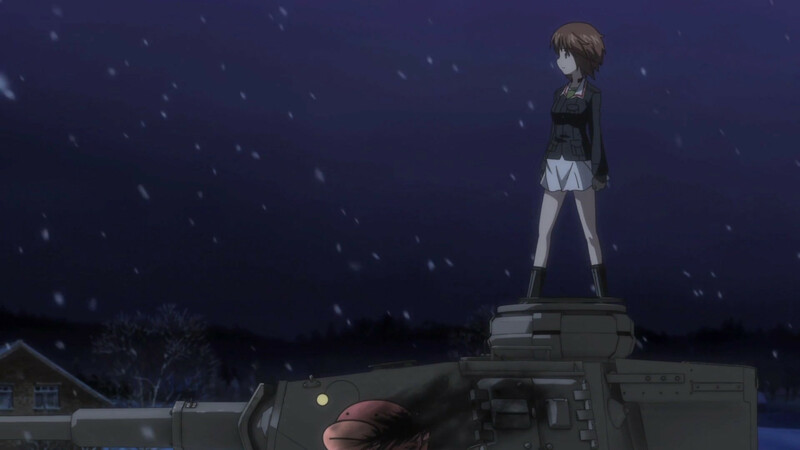 Girls und Panzer deftly ties everything together into a tight, brisk package. Every episode feels purposeful, always moving forward, focusing keenly on each tank battle and rarely veering into slice-of-life territory. Even the clip shows feel purposeful to some extent. Little, if anything, feels wasted. Girls und Panzer’s structure and pacing feel more like Dragnet and Adam-12 than Saved by the Bell or, I would imagine, K-On! Personally, I would have preferred some school- and life-focused episodes between the tank battles, but I nevertheless respect the steady hand that has kept the story moving along. Everything I just wrote, however, could have applied to any well-made show. 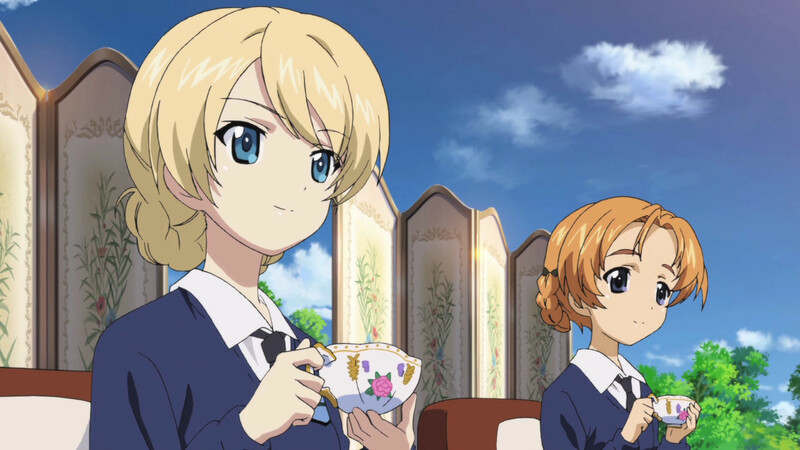 What, then, really sets Girls und Panzer apart as a sleeper hit? We come full-circle to its ridiculous-sounding premise of high-school girls fighting in tanks. Many will dismiss it as yet another desperate K-On!-alike, while others will simply balk at the seemingly unnatural mash-up. Too bad they’ll also be missing out on one of the most lovingly crafted anime of Autumn 2012. 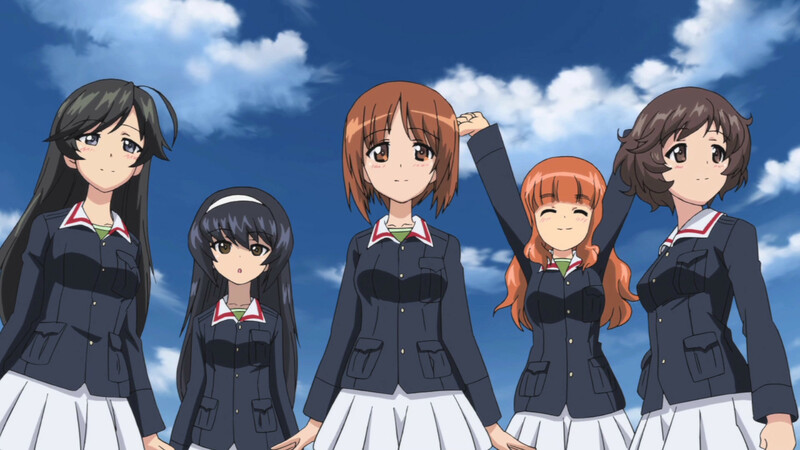 Girls und Panzer gives the impression of a cheap, ditzy, fanservice-laden action show and instead delivers a compelling, tightly directed sports underdog drama with lovely artwork, a note-perfect soundtrack, and strong characterizations. 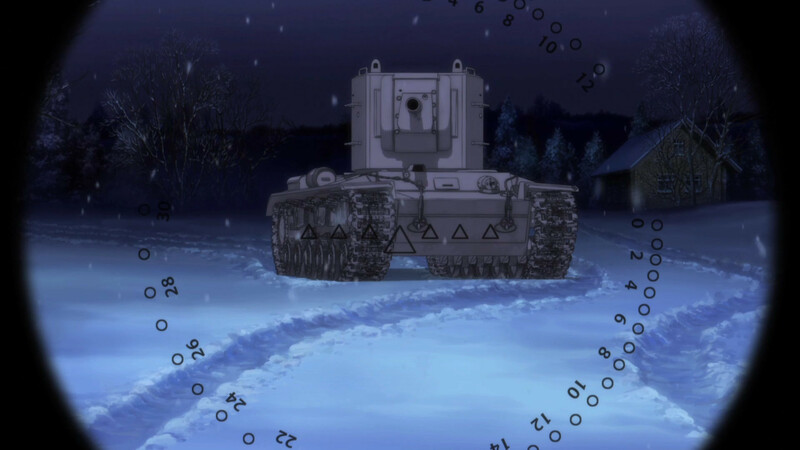 Girls und Panzer episodes 1 through 10.5 are currently streaming on Crunchyroll. Normally, new episodes would air every Wednesday at 8 PM Pacific Standard Time for premium users, and free users would gain access the week after. 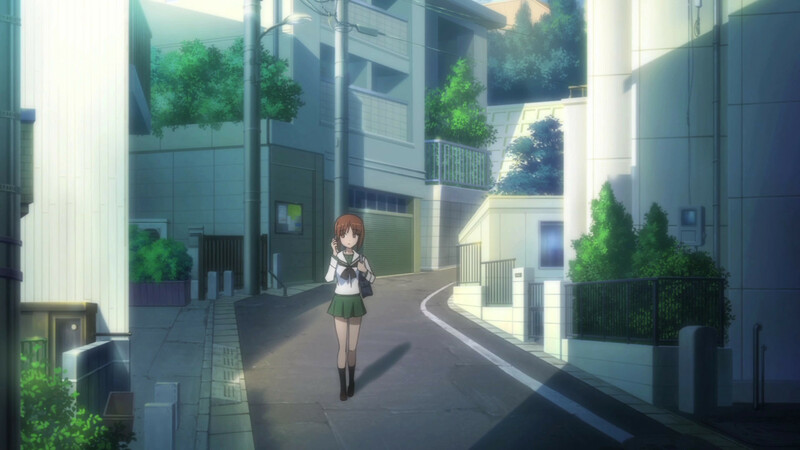 However, due to Girls und Panzer’s production delays, episodes 11 and 12, the final episodes, will not be ready until as late as March 2013. Oscar joined oprainfall late September 2012 in response to a recruitment drive. He quickly discovered his job was much harder than he had anticipated. Despite the constant challenge, he has come to enjoy his responsibilities. When he is not scrambling to meet a deadline, Oscar enjoys story-driven games with a strong narrative. He is especially fond of computer adventure games, role-playing games, and visual novels. He hopes the world will one day awaken to the power of video games as a storytelling medium.